This book provides a hands-on introductory course on concepts of C programming using a PIC® microcontroller and CCS C compiler. Through a project-based approach, this book provides an easy to understand method of learning the correct and efficient practices to program a PIC® microcontroller in C language. Principles of C programming are introduced gradually, building on skill sets and knowledge. 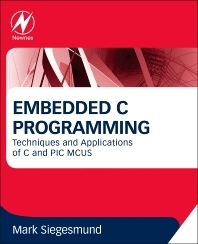 Early chapters emphasize the understanding of C language through experience and exercises, while the latter half of the book covers the PIC® microcontroller, its peripherals, and how to use those peripherals from within C in great detail. This book demonstrates the programming methodology and tools used by most professionals in embedded design, and will enable you to apply your knowledge and programming skills for any real-life application. Providing a step-by-step guide to the subject matter, this book will encourage you to alter, expand, and customize code for use in your own projects. Electronic engineering and software engineering students, especially on embedded systems courses; students of computer science and information systems; professional software and electronic engineers; hobbyists. Why Do We Need Interrupts? Mark Siegesmund is a software engineer with over 30 years of experience in embedded sytems within the military, industrial and commercial sectors. He is the founder of Custom Computer Services, Inc. (CCS). CCS specializes in embedded software and hardware, offering development tools for Microchip MCUs and DSCs, as well as a line of embedded Ethernet development.